​Milan manager Gennaro Gattuso has admitted he'd like to keep hold of striker Gonzalo Higuain despite reports linking the Argentine forward with a move to Chelsea. Higuain, 31, moved to San Siro on loan alongside Mattia Caldara over the summer, in a deal which saw Leonardo Bonucci return to Juventus. The striker has struggled for the Rossoneri this season though, scoring eight goals in 20 games across all competitions. Despite Milan having an option to buy ​Higuain at the end of the season, ​Chelsea are reported to be interested in the forward, and could make a move to sign the striker during the January transfer window, although Gattuso is hoping to see his number nine remain stay instead. 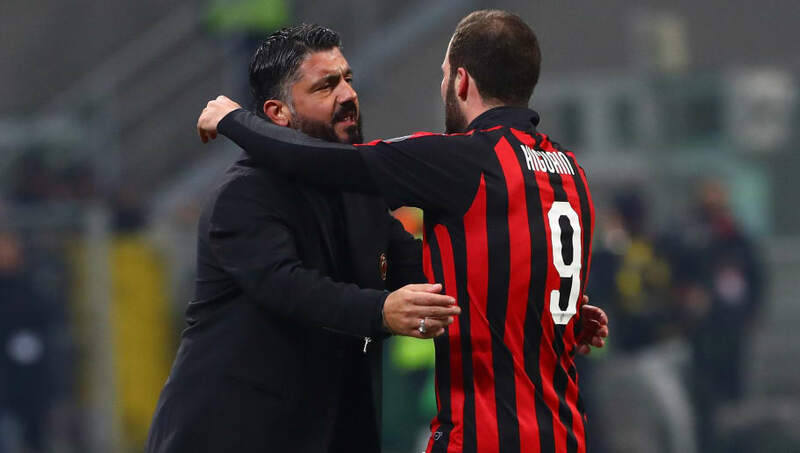 Speaking ahead of ​Milan's Coppa Italia game against Sampdoria, as quoted by ​Goal, Gattuso said: "Higuain? Gonzalo has presented himself well. I hope that he stays here as long as possible; if it's not like this, we'll see. It will not be a problem for me." Milan currently find themselves fifth in Serie A, just a point and place behind SS Lazio in fourth, with the club targeting a top four finish to secure Champions League football for next season, as Gattuso is under pressure to keep his job at San Siro. There has been some good news for the club this transfer window however after ​signing Lucas Paqueta from Flamengo for €35m, with Gattuso impressed by the impact the Brazilian has already made. He added: "Paqueta is a sharp player, a player with precise characteristics. He seems like a European player, not a Brazilian, he has a Brazilian style of play but he knows the field well, he has physical quality. His head works well even in a tactical sense. This is something important that I am surprised about."